One of the Volkswagen siblings is ‘Simply Clever’ while there is a 'Brat' in the family. 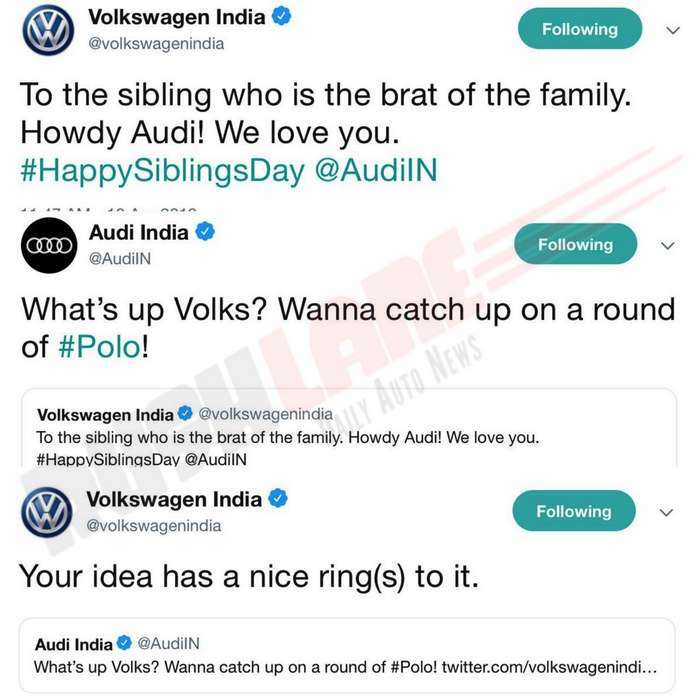 Siblings Day was celebrated on 10th April in some part of the United States, but Volkswagen India also celebrated this special day by sending out greetings to Audi, Skoda and Porsche. 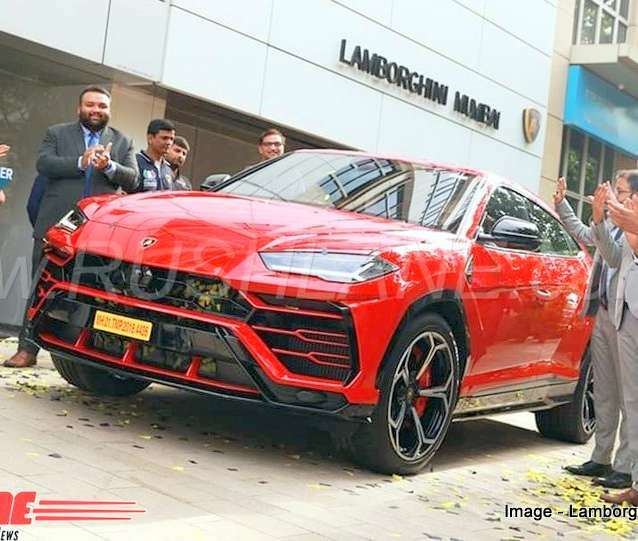 Volkswagen India sent out friendly tweets to its extended family that includes the Audi, Skoda, Lamborghini and Porsche, not only showing that they are a part of one big extended family but also to draw attention to the vastness of the Group. 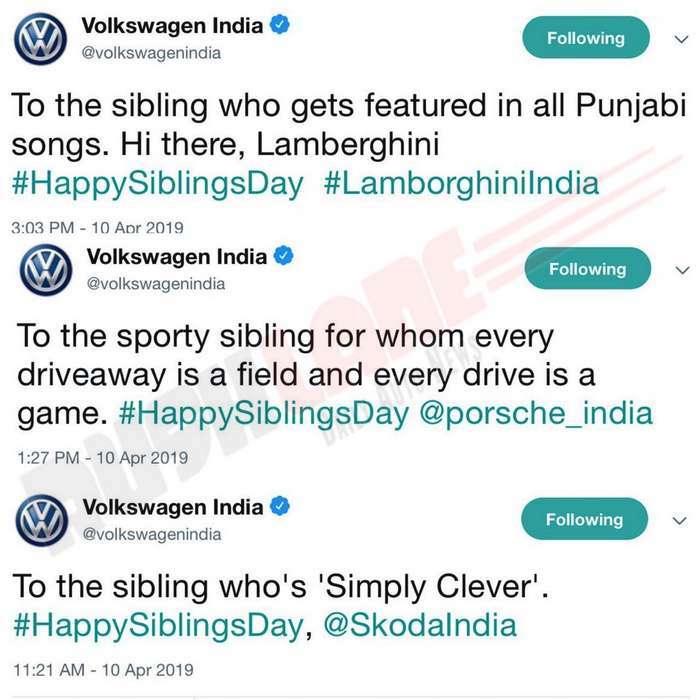 To Skoda India, the tweet read “To the sibling who’s Simply Clever” while the message to Audi was addressed as “To the sibling who is the brat of the family. Howdy Audi! We love you”. Audi India replied saying “What’s up Volks? Wanna catch up on a round of #Polo!”. Volkswagen got back – “Your idea has a nice ring(s) to it. Message from Volkswagen to Porsche highlights its sporty character with the Tweet “To the sporty sibling for whom every driveaway is a field and every drive is a game”. And while Volkswagen India’s online game seems strong on the day, a lot is desired when it comes to sales. Apart from Ameo, the company has not launched any new mass-market car in recent years in India. For a company whose name literally means ‘People’s car’, not many people are queuing up in India. But Volkswagen has promised that change is around the corner. Volkswagen Group is also set to merge all three of its entities Volkswagen India Private Ltd (VWIPL), Volkswagen Group Sales India Private Ltd (NSC) and Skoda Auto India Private Ltd (SAIPL) in India. This merger has been approved by the boards of all three companies and is a part of the Volkswagen Group’s ‘India 2.0’ strategy. The combined brands will work under the leadership of Mr. Gurpratap Boparai Managing Director, Volkswagen India Private Ltd and Skoda Auto India Private Ltd. The brands will each maintain their individual identities with exclusive dealership networks and customer initiatives while the three companies will work together in enhancing synergies in further expanding the growth market.